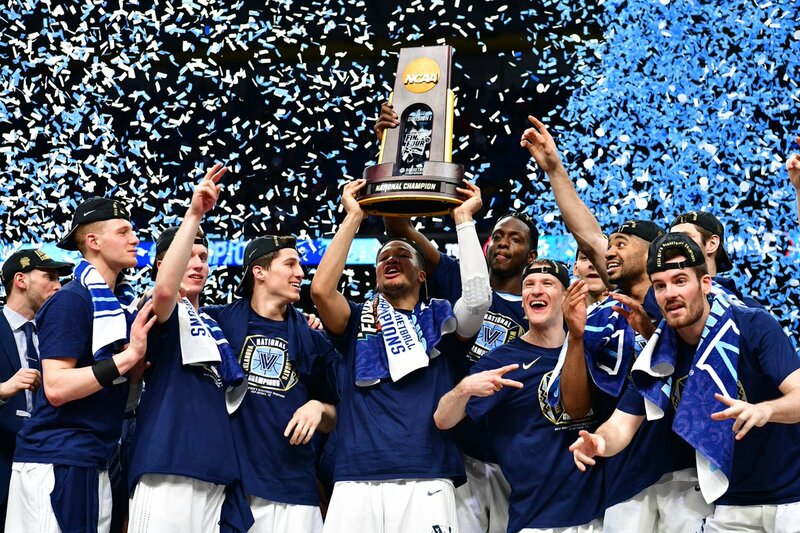 The Villanova Wildcats have done it again, defeating the Michigan Wolverines in the 2018 National Championship 79-62 in San Antonio, Texas on Monday, March 2. This is the Wildcats’ second Championship victory in three years, previously defeating the North Carolina Tar Heels 77-74 two seasons ago. Donte DiVincenzo, sophomore guard for the Wildcats, led the way for Villanova with 31 points and five rebounds off the bench, which helped them secure their second title in three years. Mikal Bridges, junior forward for the Wildcats, also helped pave the way to victory, putting up 19 points and garnering four rebounds. Despite the loss, Muhammad Ali Abdur-Rahkman, senior guard for the Wolverines, scored 23 points in a stellar performance. Moritz Wagner, junior forward who led Michigan to the National Championship, tallied 16 points and seven rebounds. Villanova shot 27-57 from the field, compared to Michigan’s 24-55. Both teams struggled to connect from deep on the night. Villanova made just 10-27 of their three point attempts, compared to Michigan’s abysmal 3-23. Michigan and Villanova both faired well from the free throw line, with the Wildcats converting on 15-20 of their attempts. The Wolverines shot 11-18 from the line, which helped them stay in the game early on before Villanova took over. With more upsets than usual this year, the Wildcats stayed true to their game and avoided being another one seed to be upset in the tournament, winning every game in the tournament by double-digits. In the first round, Villanova took out the 16 seed Radford Highlanders with ease by a score of 87-61. From then on out, Villanova stayed hot and defeated the ninth seed Alabama Crimson Tide in the second round, 81-58. Following this victory, the Wildcats defeated the fifth seed West Virginia Mountaineers in the Sweet Sixteen by a score of 90-78. Villanova continued to cruise, steamrolling their way through the Elite Eight, taking down the third seed Texas Tech Red Raiders 71-59. Eric Paschall, junior guard for the Wildcats, dominated the boards, racking up 14 rebounds in the game and dropped in a helpful 12 points. On the other side of the bracket, the Wolverines went up against the 14-seed Montana Grizzlies in the first round, taking the victory by a score of 61-47. Michigan came out on top in a close battle against the sixth seed Houston Cougars in the second round on a game-winning buzzer-beater by freshman guard Jordan Poole. The Wolverines carried over their energy into the Sweet Sixteen, breezing to a victory over the seventh seed Texas A&M Aggies by a score of 99-72. Michigan was tested in the Elite Eight by the ninth seed Florida State Seminoles, but they ended up winning in a close match up by a score of 58-54. With the Final Four set, Villanova and Michigan prepared to take on their next opponents with hopes of reaching the biggest stage, the National Championship. Villanova went up against a fellow one seed, the Kansas Jayhawks and showed no signs of slowing down, earning another blowout win by a score of 95-79. Paschall poured in 24 points, leading Villanova to their second National Championship appearance in two years. DiVincenzo, the hero of the National Championship game, assisted in the Final Four victory with 15 points and eight rebounds. The Wolverines matched up with the Cinderella 11 seed Loyola Ramblers, ending their underdog run with a 69-57 victory. Wagner finished with a double-double, racking up 24 points and 15 rebounds in a monstrous performance. Charles Matthews, redshirt sophomore guard for the Wolverines, played a huge role in the Final Four win, scoring 17 points and five rebounds. Following their 79-62 victory against the third seed Michigan Wolverines, the Villanova Wildcats now have three NCAA championships under their belt. Their first championship came in 1985 when they defeated the Georgetown Hoyas 66-64. The Wildcats failed to win another title until 2016 when Kris Jenkins connected on the game winner to defeat the North Carolina Tar Heels 77-74. Villanova will look to win their fourth National Championship in school history next year.